Becoming a pilot for the U.S. Air Force never crossed Jake Marino’s mind growing up. He wanted to become a teacher. predicts a 10 percent pilot shortage in 2020.
of 65 in the next 10 years. Adm. Jack Fetterman and Capt. J.J. Coonan, both of whom are deceased. STEM, at the National Flight Academy. become tomorrow’s leaders and creating a competitive workforce for the 21st century. during the past six years, it has introduced a new component -- job training. It also offers a “3-Day Cruise” during six spring break weeks in March and April. aviation maintenance, cybersecurity, air traffic control and aerospace engineering. Escambia, Franklin, Gulf, Santa Rosa, Okaloosa, Walton and Wakulla counties. “We want students to be qualified for the jobs they are trained for,” Gaetz said. exist by 2037, Boeing forecasted. planes and helicopters receive maintenance. onto an elevator that brings them back to the top deck of the aircraft carrier. deck. They had to complete the task in 10 minutes. pushback tug to move the jet. better the groups did the task. None completed it, however. Beach. He nearly got the plane on the elevator in the time that was allotted. the 13-year-old said that she had fun. She likes NFA’s virtual reality program emphasizing aircraft repair. Academy launched its aircraft carrier, Ambition. Universal Studios, the Disney Imagineers, and David Nixon Productions. meteorology, along with core values, teamwork and leadership skills. gone up each year, reaching 3,478 last year. countries and four U.S. territories. Up to 260 youth can attend each session. rescues, or flying to different bases. improved their skills by the end of their six-day deployment by more than 20 percent. “We want to ignite their passion for STEM,” Boven said. about all the careers they could choose. Register for the six-day STEM program on the NFA website at www. 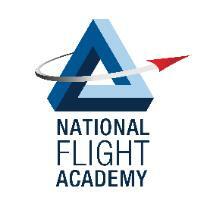 NationalFlightAcademy.com, call 850-458-7836 or call toll-free at 877-552-3632. Programs start Sunday and run on a weekly basis from May 26 through August 11.